...A Minnesota federal jury struck down claims on a pair of snowmobile patents Bombardier had asserted against Arctic Cat. The decision last week occurred one day before the Federal Circuit threw into doubt part of a nearly $50 million infringement win Arctic Cat had scored against Bombardier over jet ski steering technology. The Minnesota jury concluded that Arctic Cat Inc. infringed Bombardier Recreational Products Inc.’s ‘669 patent covering snowmobile rider positioning and U.S. District Judge John R. Tunheim had already concluded Bombardier’s ‘847 patent for vehicle frame construction was infringed. But it didn’t matter: The contested claims from both patents are invalid, the jury found. The '669 patent’s claims, 88 and 92-95, are invalid, the jury found, as both indefinite and thus too ambiguous to follow, and also anticipated by prior art in the field. The jury struck down claims 1 and 6-8 of the ‘847 patent as both anticipated and obvious to try. Those findings meant the jury never got to questions on damages against Arctic Cat. Bombardier said in a statement Thursday that it was "obviously very disappointed." "We will review the ruling and decide how we want to go on from here," the company said. Counsel for Arctic Cat did not respond Thursday to a press inquiry. The two sides have spent years fighting over a variety of patents, with the instant suit tracing to a complaint Bombardier filed in 2011 accusing Arctic Cat’s snowmobiles of infringing four patents in all, including the two patents on which the jury ruled Wednesday. The legal fight has gone both ways, with Arctic Cat scoring a nearly $50 million judgment against Bombardier after a Florida federal jury concluded that Bombardier’s Sea-Doos infringed two separate Arctic Cat patents for off-throttle assisted jet ski steering. But a Federal Circuit panel partially hit the reset button on that win Thursday with a decision concluding that Bombardier was wrongly given the burden of demonstrating that Arctic Cat-licensee Honda failed to have proper markings for the challenged thrust steering patents. That case, the Federal Circuit said, must now go back to trial, although the panel agreed that the lower court judge properly rejected Bombardier’s motions for judgment as a matter of law as to obviousness, royalties and others in the dispute. A ruling in favor of Bombardier at trial would mean that infringement did not take place until the company received notice from Arctic Cat, drastically cutting potential damages. The patents-in-suit are U.S. Patent Nos. 7,124,847 and 7,213,669. The case is Bombardier Recreational Products Inc., et al. v. Arctic Cat Inc., et al., case number 0:12-cv-02706 in the U.S. District Court for the District of Minnesota. --Additional reporting by Matthew Guarnaccia, Cara Salvatore and Carolina Bolado. Editing by Joe Phalon. How confusing..... Typical lawyer jargon. The consumer is left to pay for all this nonsense. At the same time, I hope arctic cat wins all of these lawsuits. Mike F, that is exactly what I thought too! They "picked" on AC in the first place because they thought they could force them into submission. That isn't going to happen anymore with Textron. BRP will go running back with their tail between their legs. The official statement from BRP should have read "just kidding". BRP has deeper pockets than Textron so we will see how long they keep pushing it and were this goes????? I always thought cat was working on a rev style chassis and when the great Blair Morgan left that went with him to doo. Cat should sue doo for the front a arms. Doo’s are looking more like cats in the front. Krom, BRP's has funds available from Bain Capital 77 billion and Caisse de dépôt et placement du Québec 286.5 billion so it really is not even close.............so your point? My point is that no one wins but the lawyers! Kevin: BRP is not part of Bain Capitol. THey are there own company. Was sold off years ago. Get with the system. May be invested but not owned by them. Big difference! Sounds like BRP is going to go back to court on this one as their patent has been clearly infringed upon. A frame assembly is described including a tunnel, an engine cradle disposed forward of the tunnel and connected thereto, and a sub-frame disposed forward of the engine cradle and connected thereto. A forward support assembly extends upwardly from the subframe. An upper column extends upwardly from the engine cradle to connect with the forward support assembly. A rear brace assembly extends upwardly from the tunnel to connect with the forward support assembly and the upper column. In one embodiment, the frame assembly further includes an engine disposed in the engine cradle. An endless track is operatively connected to the engine and disposed beneath the tunnel for propulsion. A pair of skis is operatively connected to a steering device for steering. In another embodiment, the frame assembly further includes an engine disposed in the engine cradle. A rear wheel is operatively connected to the engine and disposed beneath the tunnel for propulsion, and two front wheels are operatively connected to a steering device for steering. Just saying after reading that disposition that the patent jargon is so vague you could be describing a 1976 Pantera chassis. That's what the court is saying. The patent was infringed on but the patent is written so poorly as to describe many sleds made many years ago that had engine cradles or bracing to locate the engine firmly in place. Like a 1976 Pantera or a 1972 Speedway or the Scorpion Odd Job Sno-Pro from the mid 70's. Nothings really new under the sun, just rehashed and reworked. That makes the patent a bad patent and worthless in this courts eyes. But yes, lawyers will make money and the suit will probably go on. Peace- out. 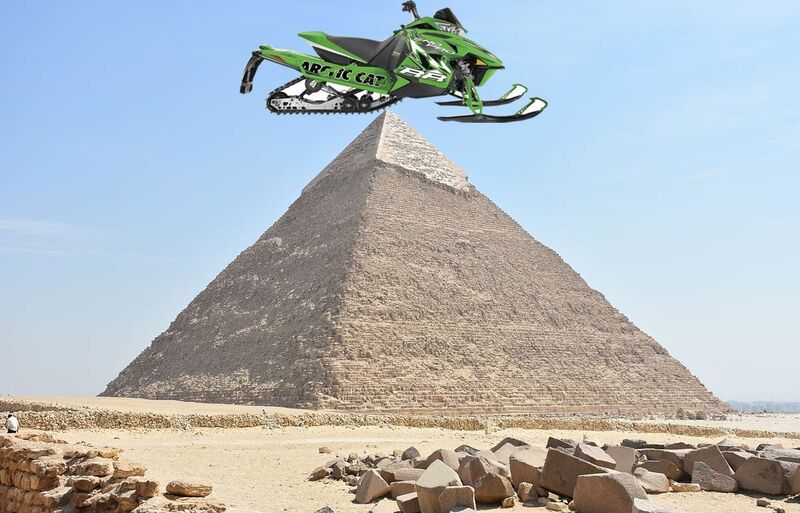 Good for Arctic cat. BRP also lost a lawsuit that arctic filed about some tiger shark technology from the 90s on new sea doos. Always trying to steal good technology. Cat should sue all of the other OEMS. Cat invented the first independent front suspension which all of the OEMS use today.